For the second straight season, Portland has one of the NBA’s top-10 defenses. For a team long known for its success offensively, the Blazers are crafting a new identity. When LeBron went west, the Blazers became something of a trendy pick when prognosticators had to guess which team would fall out of the playoff bracket to accommodate the Lakers. Portland, though finishing third in the conference last season, was only three games ahead of the ninth seed, and then the Blazers faltered in the playoffs against the small-ball Pelicans. And yet, halfway through November, Portland currently sits second in the West, with talented squads like the Rockets, Jazz, and Pelicans on the outside looking in. Perhaps even more surprising is for the second straight year the Blazers are getting after it defensively. During PDX’s rise to League Pass favorite, it was the team’s offense that garnered the most headlines. Damian Lillard and CJ McCollum have essentially been the Diet Splash Brothers since teaming up, and their bombs-away mentality has always made the Blazers not only fun to watch, but a consistent postseason participant. A year ago, Portland as a whole matured defensively, finishing sixth in defensive rating. And entering Friday, the Blazers are sitting in the same spot, currently one of only two teams to remain in the top six from last season. Layman, who starts with Dame, CJ, Jusuf Nurkic, and Al-Farouq Aminu, pointed to communication as a big reason for Portland’s success guarding opponents. In his estimation, athletic ability only goes so far, but a full understanding of the game plan and the team across from you can take a defense to the next level. The Blazers’ starting five currently has a defensive rating of 107.2, which isn’t elite, but would fall just barely outside of the top 10. Portland’s closing group, which subs Layman for Evan Turner, has been an absolute menace. That unit has a defensive efficiency of 89.0. While defending better than the Bad Boys Pistons may not be sustainable, this is now the second straight season the Lillard-McCollum-Aminu-Turner-Nurkic group has a sub-100 defensive rating. 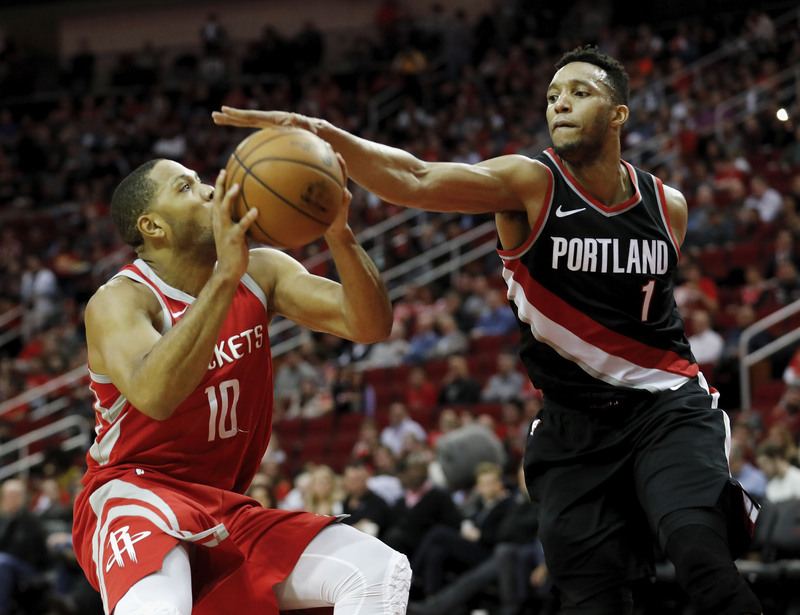 “We stepped up and accepted the challenge,” Turner told The Crossover when asked about Portland’s defensive transformation over his three seasons in Oregon. “We comprehended that when we aren’t going to hit shots, defense is going to win games. Last year our offense was great, but we were still .500 because of our defensive intensity. As for the success of the closing group, Turner listed communication, experience and confidence as reasons why those five have had so much success. One of the common denominators in both the starters and finishers are Lillard and McCollum, who people like me long wondered could ever work together on an elite defense. Currently, Portland has a 107.0 defensive rating with Dame and CJ sharing the floor, which meets the top-10 benchmark often associated with title contenders. That’s actually worse than last year’s mark of 103.8, but a massive improvement in offense has negated the difference. While Lillard and McCollum may not be lockdown guys Terry Stotts will throw on an island, they have proven they can more than hold their own. Both have grown a lot as pick-and-roll defenders, not only when it comes to fighting through screens, but also through leveraging the talents of Nurkic to siphon opponents into spots Portland wants them to go. That’s when the Blazers’ communication and experience is most evident, when the guards can perfectly position themselves so opponents are forced to either reset or dribble into a brick wall. Turner also passionately credited both players for their fearlessness. For example, when beating the Celtics earlier in November, Lillard guarded Kyrie Irving early and often when both were on the floor. In general, the Blazers let guys match up with their position, and they don’t switch lazily on the perimeter early in the shot clock. And I haven’t said much about the bench, but Portland’s second unit, featuring Turner, Nik Stauskas, Seth Curry, Meyers Leonard and Zach Collins, is also defending its brains out to start the season. That group will come down to Earth from its 72.9 defensive rating, but stingy D is an essential backbone to any group without an elite offensive threat. There still has to be some fear that come playoff time Portland will need more versatility. The Pelicans worked them last summer by going small, and Nurkic couldn’t keep up with Anthony Davis. The Blazers could almost definitely use another rangy wing, though you could say the same thing of about 25 teams in the league. Collins does offer some hope as a more mobile big who can be utilized when teams play smaller. Collins’s potential is certainly exciting, and he’s shown flashes of brilliance early this season, but he doesn’t have the same offensive chemistry with Portland’s guards as Nurkic. For now, the Blazers are building off the success they established last season. PDX is second in the NBA in net rating, with the fourth-best offense and sixth-best defense. Whichever teams in the West are hoping to enter the playoffs when spring approaches will probably have to be looking for new targets to knock off by then.